Welcome to Deckstainhelp.com, your source for the latest tips, tricks, deck stain industry insights. This is an update for our previously published article, discussing whether or not you should stain the underside of deck boards in 2019. We want to hear from you. Leave us a comment and tell is if you recommend staining the underside of deck boards, and why or why not. Do You Need to Stain the Undersides of a Deck? Bringing up some debate is whether or not you should stain the undersides of a deck. It is common and advisable to stain the weather-exposed surfaces of a deck to protect them from water and sun damage. But do the undersides of a deck also need to be protected? How Much Deck Stain Should I Buy? Update 2019 for How Much Deck Stain Should I Buy? 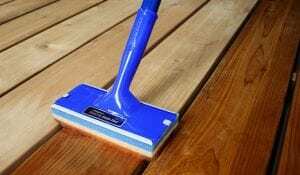 DeckStainHelp.com has become the Internet’s go-to site for wood surface staining tips. In this article, we offer insight to answer the conundrum of how much stain you should buy to complete a project. If you have questions on how to estimate the number of supplies to purchase for a project, feel free to leave us a comment with pictures. How Much Deck Stain and Prepping Products Should I Buy? Before staining a deck you need to figure out the deck’s total square footage. Once this calculation is considered, you can figure out how many gallons of deck stain you need by reading the coverage rate of the stain you are buying. On average most deck stains cover 150-300 sq. ft. per gallon depending on the age, condition, and porosity of the wood.